In 1965, during our exhibition at Stockholm's Museum of Modern Art, we had our first occasion to watch how school children, brought to the Museum by their teachers, enthusiastically descended upon our Sound Sculptures. The phenomenon would later repeat itself in various cities in Germany, Belgium, Denmark, France and the USA. "You've created something the children respond to immediately. We have to teach them music without being musicians ourselves. Could you come up with instruments that people like us can use to produce a 'musical awakening'?" When we had exhibited in New York at the Waddell and Staempfli galleries, we'd been invited by the Guggenheim Foundation to participate in a programme called, "Learning to Read through the Arts*". The programme had been organised by the Board of Education*, using our sculptures, to broaden the perspectives of children from the ghettos. Once back in Paris, we used the experience to create instruments adapted to this type of education. With the help of my son, Vincent, and my assistant, Alain Dumont, we came up with an assortment of sculpture-instruments, 14 of which are still currently used. It took ten years to perfect the programme. During the process, we worked with thousands of children in a variety of countries, these instruments are currently in use in more than 400 schools all over the world. As the sounds don't have a well-defined, fundamental frequency, the instruments are not assembled according to pitch but according to a juxtaposition of timbres. Our method resembled that used in the1950's to compose synthesised music, employing pre-recorded tones rather than those produced by the precisely tuned instruments of an orchestra. 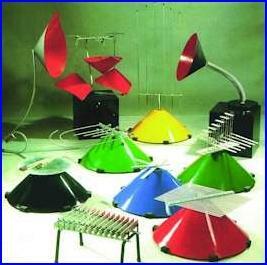 We were influenced by the ease with which contemporary plastic art becomes a teaching tool. For example, at the pre-school level when children are supplied with paints, they apply them to paper anyway they want according to their inner visions. Little by little, they learn to structure what they paint and thus structure their ideas. We wanted to create a tool that would produce the same effect musically -- providing the children with notes instead of paints with which they could create original melodies. As far as composition is concerned, abstract painting is no easier than figurative painting. The same can be said for sounds. Beyond the entertainment and commercial aspects, art is the expression of the sensory perception of the world around us and the responses that invokes in the interior of man. We had been impressed, during the New York experience, by how much providing a means of expression to the underprivileged children had helped them communicate and adapt to society. At the beginning of the century, Afro-Americans established their identity through music. Thanks to jazz, they were able to regain some of their human dignity. We hope that our instruments serve the same purpose for those in search of human dignity today. During the late 1970's and early 1980's we were invited to give demonstrations in the schools of Paris and its suburbs, and in Brittany. Vincent would pack up the unassembled instruments in his car and go off to lead the demonstrations. 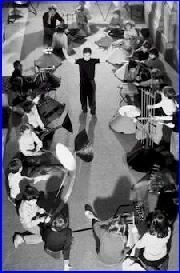 He would arrive in class where he would put the instruments together for the children to play. 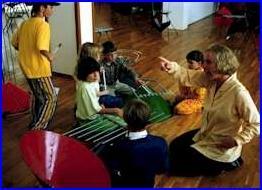 The goal was to teach them to listen to the sounds they produced individually, those their neighbour produced, then have them try to play together, thus teaching musicality to the children before they learned technique. The instruments are designed so that a simple gesture will immediately produce pleasing tones that don't depend on a knowledge of pre-established harmonies. The originality of the design has another benefit. Often a child who has seen someone like Rubenstein play the piano on television decides beforehand that he will never be able to master it himself. 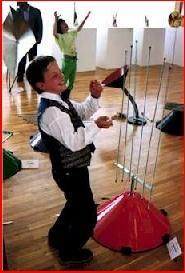 Our instruments are something the child has never seen before and he approaches them with confidence. From the beginning, we worked with mentally and physically handicapped children. The instruments are very well-adapted to this use. Two people, Magali Viallefont and Romain Pomedio, have been particularly important in this venture. With our help, Magali founded her own association called Musique dans l'éducation et le soin des handicapés (MESH) . It was also the topic of her doctorate theses, "Qu'apporte la pratique musicale á la gestuelle des handicappés." For eight years, we, along with Romain Pomedio, worked with autistic children in the town of St. Michel sur Orge. A film about this project was made by the Franco-German television station, Arte. The work goes on to this very day. Our enterprise has grown to the point where we needed to form a company to manage appointments, administrative functions, and sales. We obtained a large grant from the Fond Intervention Culturel which has greatly aided our development. Each year, we give exhibitions that reach approximately 10,000 children. 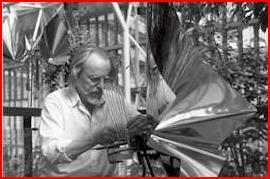 In 1998-99, sale of our instruments continues here and abroad. We have also organised training programmes for teachers and care-givers, as well as giving exhibitions in cultural centres and libraries throughout France. We took a certain risk when we decided to stop concentrating on art strictly for the collector. But when we watch the radiant faces of children as they discover our instrument-sculptors, as well as their own artistic and personal potential, we know the risk was worth it.